For years, Israel and Jordan have been at odds as to which side of the Jordan River is the actual site of Jesus’ baptism, as both sides vie for the title to increase tourism. Israel upgraded its shoreline with changing rooms and a wooden deck access to the murky waters. 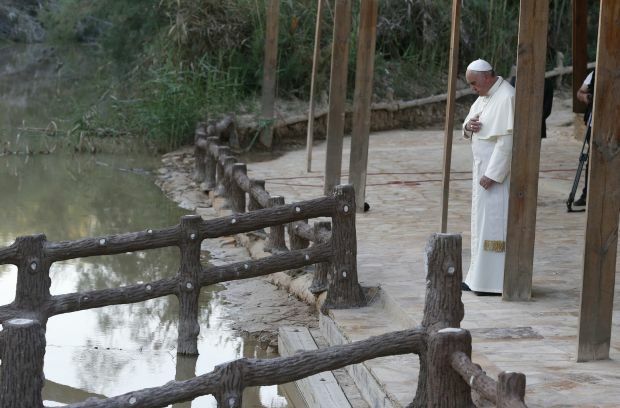 But three popes have visited Jordan’s eastern shore as a sign of the Catholic Church’s official recognition of the site known as Bethany Beyond the Jordan. The Gospel of John (1:28 and 10:40) records this place as where John the Baptist carried out his baptisms, including that of Jesus. Pope John Paul II made the first visit to the site on his millennial pilgrimage to the Holy Land in 2000, followed by Pope Benedict XVI in 2009 and Pope Francis last year. The remains of more than 20 Christian sites over six centuries and dating to Roman and Byzantine periods have been discovered near the site. They include several churches, a prayer hall, baptismal pools and a sophisticated water reticulation system. At least 12 new churches are under construction in the area, with the Catholic Church expected to become the largest church complex in the Middle East, at nearly 323,000 square feet.